PortaSwitch Start & Grow is an entry level telecommunication services and subscriber management platform that does not compromise on functionality and feature set, but however enables ambitious start-up telecommunication service providers to instantly launch, price and provision their services while eliminating high investment requirements. 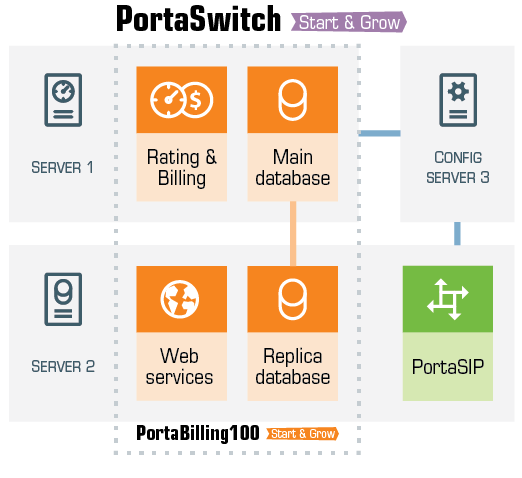 PortaSwitch Start & Grow shares exactly the same functionality with its bigger brothers PortaSwitch and PortaSwitch Procinctus. It is however smaller and requires less servers. automated provisioning of IP phones. Affordable HW: the requirements for server specifications are also more modest (see below). The only way to overcome catastrophic events and provide uninterrupted service is to have another set of servers in a different location that can continue operating during the outage at the main site. The only requirement is the sufficient amount of bandwidth between the sites to keep the data replication going. If the secondary site detects that the main site has become unavailable, the "stand-alone" mode is activated on the secondary site to provide the service to end-users: the billing engine continues to calculate applicable charges according to product, tariff and the responsible party's other billing parameters. All changes to the balance and new xDRs are written into a dedicated database. This allows the billing engine to keep track of already consumed services and avoid a balance overdraft which results in a clear history of all produced charges. When the primary site becomes available again, these changes are automatically applied to the primary database - and the secondary site is switched back to the stand-by mode. All of this happens automatically, without any need for an administrator involvement. Please find more information on hardware requirements and about how to choose your servers on a dedicated HW page. Since less computing power is involved in a smaller system with fewer physical servers and also due to the lack of simultaneous multiprocessor support, PortaSwitch Start & Grow is over 3 times less powerful than a standard PortaSwitch configuration. The upgrade from PortaSwitch Start & Grow to standard PortaSwitch or any larger configuration is seamless and requires almost no downtime.